Premium Cold Water Fish Food - Aquascape, Inc. If you want happy and healthy pond fish, you need to be feeding a high-quality fish food. 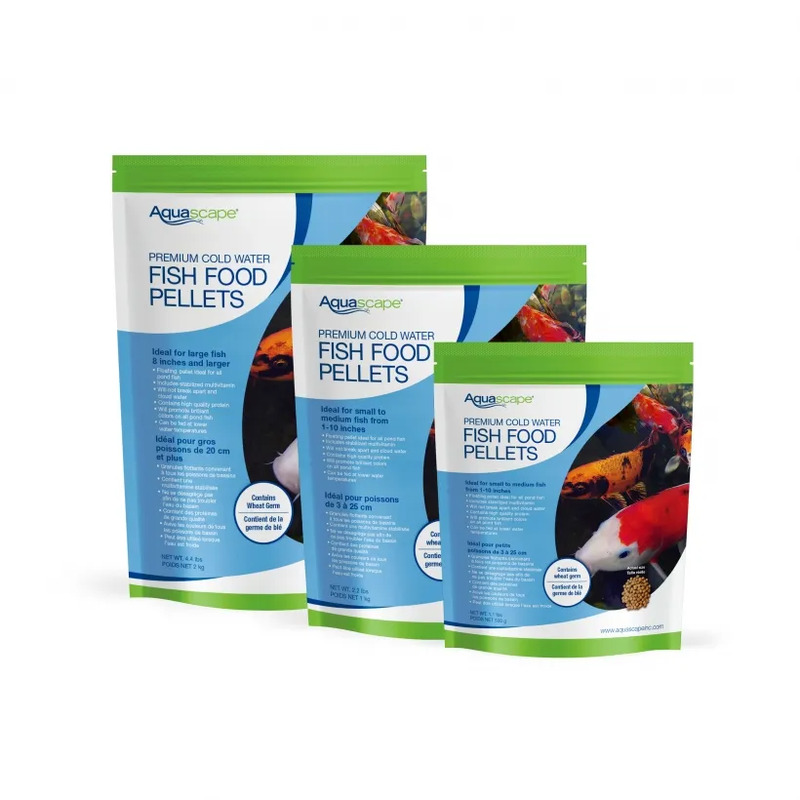 Aquascape Premium Cold Water Fish Food Pellets are specially formulated for cold water conditions and provide your pond fish with the nutrition they need to thrive at an affordable price. Our cold water fish food contains wheat germ, making it ideal for use in water as cold as 50-degrees Fahrenheit. All Aquascape fish foods contain probiotics that aid in digestion and reduce fish waste, while the high-quality protein included helps to optimize growth rates. The floating pellets contain stabilized vitamin C and other quality ingredients and are scientifically formulated for all pond fish, including koi and goldfish. Aquascape fish food will not break apart during feeding, helping to maintain clear water conditions. Aquascape is passionate about the products we produce, providing unique products, designs, and features that stand above the competition. How much: Feed as much as fish will completely consume within three minutes. How often: Feed up to three times daily. How to: When feeding, sprinkle pond food in the same area of pond. Your fish will quickly learn to come to the same spot, helping to reduce uneaten food. We recommend that you use a small feeding device like a measuring scoop. You will quickly learn the optimum amount to feed. in less waste, better nutrition and a cleaner pond. Please note: Water temperature should be a minimum of 50° F or 10° C. before feeding this formulation. Keep out of reach of children. DO NOT STORE OUTSIDE. Store at room temperature. Wheat germ meal, wheat flour, fish meal, salt, lecithin, brewers dried yeast, calcium carbonate, iron proteinate, vitamin E supplement, dried Bacillus subtilis fermentation extract, choline chloride, inositol, calcium ascorbate, l-ascorbyl-2-polyphosphate (vitamin C), manganese proteinate, zinc proteinate, biotin, niacin, calcium pantothenate, menadione dimethylpyrimidinol bisulfite (source of vitamin K), vitamin A acetate, copper proteinate, riboflavin, vitamin D3 supplement, pyridoxine hydrochloride, calcium iodate, thiamine mononitrate, sodium selenite. Total Micro organisms min 600 million CFU/lb: Bacillus Subtilis. 32% min. 40% min. 38% min. 34% min. 3% min. 4% min. 4% min. 5% min. 4% max. 3% max. 3% max. 3% max. 10% max. 10% max. 10% max. 12% max. 12% max. 12% max. 12% max. 12% max. 0.8% min. 0.8% min. 0.8% min. 0.8% min. 0.6% min. 0.8% min. 0.8% min. 0.6% min. 3,000 IU/kg min. 9,000 IU/kg min. 9,000 IU/kg min. 10,000 IU/kg min. 600 IU/kg min. 1,800 IU/kg min. 1,800 IU/kg min. 1,500 IU/kg min. 100 IU/kg min. 100 IU/kg min. 200 IU/kg min. 300 IU/kg min. 50 mg/kg min. 150 mg/kg min. 230 mg/kg min. 50 mg/kg min.